Accounts Receivable are the most important asset of every business: small or multinational, trading domestically or exporting globally. Protecting them with Credit Insurance allows you to grow safely and expand your trade in a substainable way. Learn about safe growth, better financing and new markets' expansion when you can rely on the protection of Atradius. Credit insurance from Atradius is a straightforward, cost effective and flexible way to ensure you get paid for goods and services you supply. The Atradius Special Products Unit provides tailored solutions outside the framework of our whole turnover credit insurance policies, to cover trade, trade financing and political risks. Atradius Go is the new credit insurance product for small and medium business enterprises looking to protect their receivables at an affordable price. Designed for multinational clients, Atradius Global sees your business as a whole while providing local support that mirrors your own geographical reach and multilingual policies. 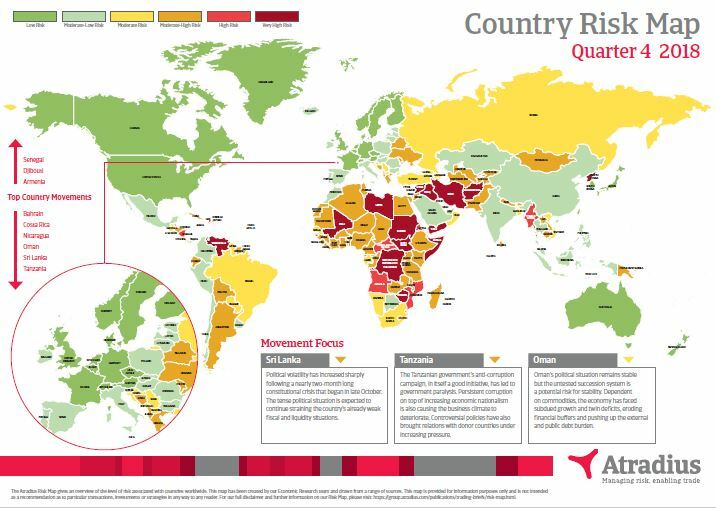 The Atradius Risk Map gives an overview of the level of trade risk associated with countries worldwide. It is based on data gathered by our Economic Research Team and focuses on a variety of factors. Highlighted countries that have experienced a rating change over the quarter: Sri Lanka, Tanzania, Oman. Hear directly from some of our US colleagues how we support your business. Our business is built on providing the very best level of support for our policy holders. What you can expect when you call the Customer Service Team? Your first point of call for everyday queries will be our Customer Service Team. You could ask us anything from policy queries to credit limits, claims, collections, or for help using our online system. As the day-to-day voice of Atradius, we make sure our team is staffed with knowledgeable, qualified policy experts. This means we can talk you through anything from technical issue or policy query, without passing you on to anyone else. Your question is likely to be answered immediately. We’re proud of the fact that the majority of the queries put to us are resolved on first contact. The customer is at the heart of Atradius, and we recognize that it is often the very simple things that make the biggest difference. Being available, having the right attitude, and doing what we say we will do. For our customers, this works. Our team works with you to find solutions. We listen to what you tell us, proactively logging all queries and seeking ways to improve what we do. Continuous improvement is important to us, because it is important to our customers. ​What you can expect from an Atradius Account Manager? ​The responsibility of an Atradius Account Manager is based on mutual trust and respect. We work hard to create a business relationship with you, understand your needs and find ways to help you grow your business. We achieve that by getting to thoroughly know you and your business, including your broker and your market. As an Account Manager, each of us work with a small number of customers, which gives us the time to build a solid relationship. We are proactive about getting to know your business and your sector. Your Atradius Account Manager will try to meet up with you or you and your broker as often as possible. We encourage face-to-face meetings as these meetings have proven to be an optimal way to build help solidify our relationship – rather than just by email or the phone. Your business and its needs are at the center of our focus. It’s the responsibility as your Account Manager to fight in your corner, helping you to grow your business through a positive trade environment. This might involve negotiating on your behalf with the buyer’s underwriter to obtain the level of cover required, or even by building relationships with the wider business community to support you. What can you expect from Risk Services? Risk underwriters are responsible for assessing and approving our exposure to risk. They are experts in their respective industry sectors, customers and market. Our Risk services team is always reviewing new financial information provided to stay on top of any development. They also spend time talking directly to you and your buyers discussing details on credit limits or general market conditions. During the life of your policy, you will be often in contact with one of our Risk services team members, by phone or in person. We strive for a quick answer time since we understand that a fast and clear decision is important to you. Sometimes underwriters can't approve a credit limit you requested. Should this ever happen, it will be our priority to explain their decision clearly. This will also help you when making decisions on trading with particular buyers. What you can expect when you make a claim? Our goal is to make sure you get your claim paid promptly. We have deadlines and aim to finalize a claim within 30 days of receiving all of the paperwork. The average amount of time it takes us to settle a claim in the US is usually about 14 business days. We also work within the policy timeframes, which allows time for our Collections colleagues to recover defaulted payments. 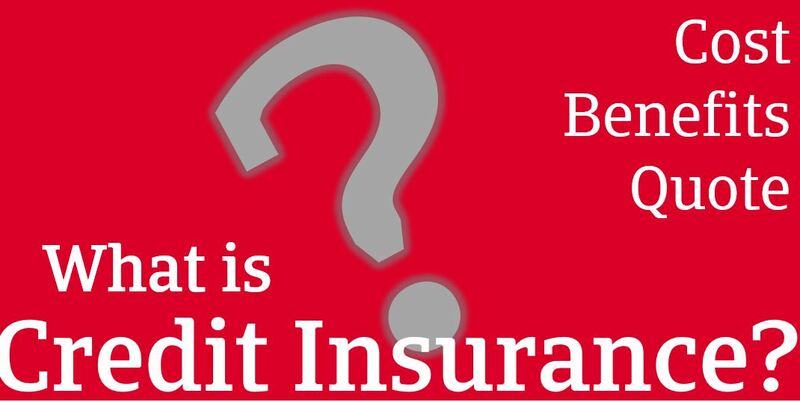 A defaulted claim would be ready for a payment six months after the invoice becomes due. Each Claims Examiner looks after their own customers and handles all of their claims from submission to completion. This allows them to get to know you, both as a person and as a business with individual needs. Our customers take out insurance with us so that their business is protected against loss and non payment due to the actions of others. When we settle a claim, it feels good to know that we have helped to protect our customer's accounts receivable and have possibly even saved their business from bankruptcy.